Venezuela: Recent developments and opinions concerning the possibility of an open military ‘intervention’ by the United States & Co 4.3333333333333 out of 5 based on 6 ratings. 6 user reviews. A recent article by Rubén Castillo for Misión Verdad (republished by Resumen Latinoaméricano) provides a succinct analysis of the most likely attack options and the Bolivarian Republic’s defence capabilities in the respective scenarios (without ruling out the concurrent implementation of all three – an all-out ‘shock and awe’ aerial attack, immediately followed by medium to large-scale frontier invasions primarily from Colombia and perhaps Brazil, accompanied by ‘low intensity’ but extremely destructive terrorist attacks and sabotage from all directions, internal and external). Indeed the latter scenario, low intensity terror attacks and sabotage, has already been underway for some time, as envisaged in the confidential ‘Masterstroke’ strategy document prepared by SouthCom that was subsequently revealed in the international press (discussed previously by the same author; Daniel Edgar, 2018). While the new Colombian president Iván Duque affirmed unequivocally during the election campaign that he was not in favour of Colombia participating in a military attack against Venezuela, Colombia and Guyana did not support a recent declaration by the ‘Lima Group’ categorically rejecting military intervention and Duque is taking every opportunity to antagonize and demonize the Venezuelan government and demonstrate his absolute loyalty to his masters in Washington and Miami. Moreover, in a recent budget statement he announced a projected increase to the military budget of over 50% (matched by a similar level of cutbacks to funding for education and implementation of the now all but defunct peace process with the FARC), largely to fund the acquisition of an air-defence system which in current circumstances could only be used against a possible (counter-)attack from Venezuela (it is unthinkable that such a system would be used to defend the country against an attack by the United States, which already has a very substantial military and intelligence presence in Colombia). The increase is on top of already record levels of military spending; while the FARC-EP disarmed completely following the signing of the Peace Accord, the Colombian State has not relinquished one piece of military equipment or ended compulsory military service. To the contrary, it continued to increase military spending. This reveals a considerable dilemma for the would-be aggressors: while Colombia has one of the highest levels of military spending and possesses one of the most formidable military apparatuses on the continent, it has been designed and operated with the exclusive objective of fighting against the Colombian people in order to defend and preserve the extravagant luxuries and privileges of the political and economic elite and ‘foreign investors’ rather than defending the country and the people in an external conflict with a well-armed opponent (much less conducting a large-scale offensive military campaign outside the country). Perhaps Peru, a country that was not mentioned in the SouthCom document outlining the strategy to overthrow the Venezuelan government, could assist in this respect, as it possesses a large contingent of tanks and other offensive weapons that could be transferred to staging areas as they presumably won’t be needed against its traditional enemy Chile as both are currently, and have been for some time, completely compliant US client states. “In columns and editorials of the main newspapers of Colombia, the war scenario also has its detractors: ‘The only way out is diplomatic pressure’, says El Espectador. ‘The war speech is attractive, as well as deceptive and dangerous,’ writes analyst Laura Gil in El Tiempo. Semana magazine titled its cover this week with the phrase ‘Playing with Fire’, to allude to an analysis that concludes that ‘a military intervention in Venezuela would be catastrophic’, for which Bogotá should assume a ‘categorical position against’”. Nonetheless, at the same time many of the articles published by the same media outlets are diligently following the script laid out in Southcom’s ‘Masterstroke’ document to overthrow the Venezuelan government and impose a pliant regime of collaborators (also apparent in the realms of regional and international military, ‘diplomatic’ and economic developments more generally); sensationalizing the emigration of people from Venezuela due to economic hardship or for other reasons (invariably every person leaving Venezuela is described as a refugee on the verge of death fleeing from the brutal Maduro dictatorship), incessant criticism of the Venezuelan government alleging that Maduro bears exclusive responsibility for all problems in Venezuela (and many of the problems in Colombia), sensationalizing real or imagined clashes and incidents along the Colombia-Venezuela border, ignoring the role of paramilitary groups recruited in Colombia to sow terror and disorder in border regions and the many other terrorist attacks against infrastructure and the government in Venezuela, etc. This is most evident in the programming of Caracol and RCN, whose influence over the perceptions and attitudes of the Colombian people is difficult to exaggerate, particularly with respect to the Venezuelan president and government. While the numerous analysts and political or social organizations quoted by Nazareth Barbàs express scepticism as to possibility that the hype for war belies a real agenda as opposed to constituting nothing more than psychological warfare and political propaganda, a large number of Colombian people ingenuously repeat the insults and allegations against Maduro and Venezuela repeated daily by RCN and Caracol and have assimilated the assiduously crafted psychological warfare ‘talking points’ as immutable fact. In short, although open military conflict still seems to be a surreal and unlikely scenario, everything is being done to prepare the ground for a ‘frontier clash’ at an opportune moment, in which Colombia must attack Venezuela to avenge the tragic deaths of several soldiers and civilians following an unprovoked, ruthless and reckless incursion by a contingent of brutal Venezuelan soldiers (the number of sensationalized border incidents being reported is already increasing). It is also quite possible that although Brazil supported the most recent declaration by the Lima Group rejecting an overt military intervention against Venezuela, this was a tactical necessity that will be dropped once the national elections are completed in October. Clearly, the stakes of the pending political contest in Brazil are enormous, and it is not unreasonable to assume that the United States is doing everything possible to ensure that the presidential election in Brazil will be won by a candidate whose first loyalty is to those who control the policies emanating from Washington DC. On July 4, 2018, the AP news agency in Bogotá stated that last year the president of the United States, Donald Trump, raised the idea of ​​a military intervention in Venezuela in meetings behind closed doors with its top officials and advisers and with presidents of the region in the framework of the General Assembly of the United Nations. Recall, also, that in a press conference on August 11, 2017, Trump himself assured that the military option was open for our country. After this declaration, President Nicolás Maduro, in accordance with the military doctrine and focus of security and defence in the Bolivarian National Armed Forces (FANB), issued a series of instructions to develop a set of exercises, in civic-military union, as an answer to these aggressions. Having said this and reviewing the precedents of the US government in the region and in the world, and understanding the softening-up strategy applied to the country in the economic, financial and propaganda fields, a military intervention to our territory is not ruled out. ‘All options are still on the table’ with respect to Venezuela, where the military option is logically included, according to President Trump himself in the framework of the 73rd General Assembly of the UN. From this assumption some questions arise: Is our FANB able to respond to a possible attack by the US? What would be the possible intervention scenarios that it would use? And finally, which of these theaters of operations would be developed and how would Venezuela act? This new approach to national defence, which since the arrival of the Bolivarian Revolution has become integral in all areas that correspond to sovereignty, was accompanied by a series of elements in the procurement of weapons designed to face the possible scenario of an asymmetric or conventional war waged by external actors. During the last decade, gradually but systematically, the Venezuelan military defence equipment has been upgraded to the point of having the capacity to deny the airspace to any type of aircraft that wants to fly over it without full authorization. But beyond the fact of having modernized our entire weapons system, beyond all the military exercises that we have carried out inside or outside the territory, our greatest strategic advantage lies in our knowledge of the threats, in the systematic analysis of possible war scenarios that we could face, in efficiently distributing the defence of the territory through a Layered Integral Defence strategy, promoted from larger to smaller scale theaters by the REDI (Comprehensive Defence Region), the ADI (Comprehensive Defence Areas), the ZODI (Comprehensive Defence Zone), and finally, the ZOSE (Security Zones). This aspect of any prospective conflict has as its operational focus the war of attrition or trench warfare, where the enemy is confronted in a staggered and stabbing way, emphasizing that each defence strategy varies according to the territory to which a certain component is assigned. This responds to the military maxim of the best possible understanding and use of the terrain to improve the efficiency of combat, and would be applied in case of an occupation scenario by exogenous forces. In that sense, the Bolivarian Armed Forces recognize that the military confrontation, as a continuation of politics by other means, can vary in its forms, depending on the changing nature of the politics and the society in which it is waged. In this way, you can identify the balance point where the aggressor army is confronted, with the minimum number of casualties and loss of resources and the adaptation of the available resources, obtaining an advantage in a confrontation by way of a specific modality. In this regard, we must make it clear that for several years, Venezuela has experienced a scaled intervention process; only that the last phase, the military one, has not yet been fully developed and is still used as a threat. This is so not because the United States, as a military force, lacks the resources to carry it out. It has all the military and logistical apparatus that would be necessary; however, as usual, its army does not go to war if in the target country there is an organized defence system capable of repelling or resisting the intervention over a prolonged period. For that we only have to review recent history: Afghanistan, Iraq, Libya, Syria, among other cases of recent times. In these countries the military intervention was realized after the military component of the nation was demoralized and weakened from within its internal structures, or previously worn down by internal armed conflicts of a mercenary and terrorist nature, also propitiated by the United States, with the objective of neutralizing the defensive capabilities of the target country. With respect to Venezuela, and taking into account the margin of error implied by any projection, the intervention could take place under the hypothesis of three scenarios. Each and every one of them, also, entails a response scenario from the FANB. This scenario, although very appealing to enemy forces, because it bases its strategy on the so-called ‘softening-up fire’ that allows reducing casualties to zero because they are attacks from a distance, at the moment represents the biggest obstacle and the most difficult strategy in an eventual military attack. This is because the military and geostrategic conditions that Venezuela currently possesses do not allow it. With regard to the territorial dimension, our country has a layered defense system, consisting of an anti-aircraft defence system among the best in the world, which has already been tested by the US military forces in other latitudes (Syria, for example ) with adverse results. The political and media cost of a large-scale intervention of this type is very high because it represents a high probability of failure. Today our country has equipment that detects the enemy presence in sea and air at a minimum of 300 km in a straight line and with a ceiling that is around 25 thousand meters high. Accompanied by Su-30MK2 aircraft, which have the ability to confront any enemy before it invades our airspace, the thesis of a Lightning War (occupying the target country in a few days with a minimum number of casualties) is extremely difficult to carry out. This is compounded by the existence of civil and military focal resistance points that may be encountered in a subsequent phase of the intervention. The acquisition several years ago of the S-300VM medium-range air defence system, means that Venezuela has a staggered anti-aircraft defence system composed of ZU-23 anti-aircraft cannons, Buk-2M missile systems, and Russian Pechora-2M and S-300VM systems, capable of intercepting all kinds of targets, be they missiles or planes in a range of up to 200 kilometers. This defensive factor complicates the effectiveness of an eventual air campaign against the country. There is a likelihood that a military intervention could be carried out within the triple border that our country has with Brazil, Colombia and Guyana. 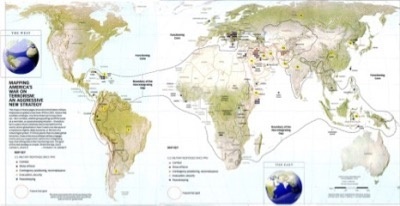 A military invasion from these locations would only be possible with the Colombian army, due to a specific geographical reason: it is the military force closest to the capital of the Republic and with greater accessibility, because there are communication channels that would facilitate such an attack. Moreover, Brazil’s reluctance to accept an intervention in Venezuela and the almost irrelevant role of Guyana in the current stage of the political conflict means that Colombia is where the first shots could come from. Specifically in Colombia, the issue operates with a different logic. Even with the support of US military bases and personnel in its territory, operationally they would have to deal with the role that different armed groups that live in those areas near the Venezuelan border, such as the so-called Colombian Self-Defence Groups and the Bacrim (‘Criminal Bands’), who would also defend their interests and areas of influence in the event of a conflict initiated in spaces that they consider their exclusive territories. Now, in terms of the military capabilities of both countries, according to the prestigious military portal Global FirePower, in its ranking of 2018, Venezuela and Colombia are virtually tied in firepower and military capabilities. However, in more specific lines, Venezuela leads. While the country has 696 combat tanks of different types, 57 self-propelled artillery vehicles and 52 rocket launchers (Smerch type), Colombia does not possess units of these key equipment for conventional or asymmetric land combat. In terms of combat aircraft and towed artillery, Colombia outnumbers Venezuela, however, the quality of Russian equipment purchased by Venezuela in these categories demonstrate greater capacity than the US equipment bought by the neighboring State. In anti-aircraft defense, for the expert in conflicts of the University of Rosario, Vincent Torrijos, ‘Colombia does not have a credible anti-aircraft defense system’, which contrasts enormously with the capabilities acquired by Venezuela in this field for several years. Understanding this weakness and acting belatedly, General José Mauricio Mancera, head of strategic planning for the Colombian Air Force, indicated that it is necessary for the neighboring country to acquire an anti-missile system to have a ‘clearly defensive policy’. This, together with the regional defence capacity that has been installed through the formation of integral defence networks, knowledge of the terrain and the operational readiness for the containment of an occupation army using asymmetric warfare, put at risk the effectiveness of any military intervention that comes from Colombia, given the advantages that Venezuela has. But beyond these aspects, one of the maxims in any war is that one must have the greatest control over the strategic variables that allow the balance to tip favorably, and for now neither Colombia nor the United States have total control of factors that range from geopolitics, disposition to real combat, and American internal drift. Another key aspect that could limit the scope of an intervention through Colombia is the preparation of the FANB in ​​the defense of the territory, its high levels of articulation and its high morale, which in this cost-benefit relationship, would be a decisive influence in our favor. The political, strategic and also economic costs of the previous forms of intervention could open the scenario of an intervention through terrorist tactics. Within the framework of the Plan for Recovery, Growth and Economic Prosperity, one of the actions taken by the Venezuelan government is aimed at equating the cost of gasoline with international prices, due to which service stations, fuel tanks and other components of PDVSA (the State-owned petroleum company), could become attack targets. The regularization of the sale of gasoline and the affectation of contraband could precipitate the activation of armed groups linked to drug trafficking on the Colombian side, who are the main beneficiaries of this business. The exercises, a little over a month ago, of responding to damage to the bridge over Lake Maracaibo, together with the frustrated assassination attempt against President Nicolás Maduro, are signs that the model of intervention through unconventional warfare is on the agenda. Given this, it is no coincidence that paramilitary groups such as the ‘Tren de Aragua’ issued a statement a few days ago declaring a frontal war against the police forces, just at the moment when tensions with the United States are at their peak. The permanent sabotage of the national electricity system, the increase in violence on the Colombian border due to the conflict of interests between paramilitaries and apparently isolated facts such as the discovery of a clandestine ammunition factory in Cabudare (located in Lara state) indicate that the irregular route is being tested and financed behind the scenes in the absence of an electoral or politically viable option to remove Chavismo from power in the medium term. In this sense, the intelligence and internal security apparatus (SEBIN, PNB and GNB) has played an important role in dismantling actions of this type, through the tactical positioning and handling of anticipated information, executed efficiently by the Force of Special Actions (FAES), as happened in January of this year in El Junquito, Miranda state, with the dismantling of Óscar Pérez’s terrorist cell. Because of the low political, economic and logistical costs that it represents for the United States, terrorism could be an option to be used to precipitate military intervention mechanisms in Venezuela, which is also not guaranteed of success given the capabilities of the national security apparatus to disarticulate mercenary factors and how it has taken the lessons provided by this type of interference in Iraq, Syria and Libya, to achieve greater effectiveness in the anticipation and detection of threats. We must consider that, for the Venezuelan government, geopolitics is also assumed as a defence policy that has a notorious influence. Among the variables that could lead the US government to take the decision of a military intervention, the economic associations with China and Russia in Venezuela play a key role, as it involves an indirect confrontation with rising financial and military powers. A strong factor of dissuasion. The Venezuelan strategy of integrating its foreign policy with that of China and Russia has been one of the most effective in this stage of the conflict. This is confirmed by President Nicolás Maduro’s recent visit to China, the arrival to the Venezuelan coast of China’s hospital ship ‘Arch of Peace’ and the bilateral meeting with Russian Foreign Minister Sergey Lavrov before his address to the plenary of the General Assembly of the United Nations. The projection of Maduro as interlocutor between competing powers and the use of national energy resources to generate counterbalances and geopolitical conditions that limit the scope of the intervention agenda, is a visible consequence of a strategy designed to avoid war as a strategic concept, at the same time that the political offensive and the willingness to fight are maintained. Stella Calloni reveals SouthCom’s secret plan to overthrow the Bolivarian Republic of Venezuela. This document, which we have already published, contradicts President Trump’s engagements to put an end to the régime changes which have characterised US imperial policy. It demonstrates that the international image of chaos in Venezuela is entirely fabricated and is an exclusive invention of Anglo-Saxon propaganda. The United States and their allies are preparing in silence a brutal plan to « put an end to the dictatorship » in Venezuela. This « Master Stroke », which is already well under way, will see its first instalment become operational before the next elections, and, if they are unable to eliminate President Nicolás Maduro during the offensive, which will be accompanied by the total machinery of propaganda, the medias, and certain acts of violence « for the defence of democracy», then Plan B is ready, and will implicate several countries, in order to impose a « multilateral force » for military intervention. Panama, Colombia, Brazil and Guyana will play a key role, with the support of Argentina and other « friends », under the control of the Pentagon. Neighbouring countries will provide bases for the combat forces, and direct support, including hospitals and stocks of supplies for the soldiers – everything is ready. All this is set out in an 11-page document which bears the signature of Admiral Kurt Walter Tidd, the current Commander-in-Chief of US SouthCom, but has not yet been made public . The document analyses the current situation and validates a war of counter-insurgency against Venezuela, supported by the paraphernalia of psychological warfare, revealing the use of persecution, harassment, belittlement, and lies used as means to get rid not only of the popular leaders, but also the People as such. The report affirms that « the Venezuelan Chavista dictatorship staggers as a result of its frequent internal problems, there is a great shortage of foodstuffs, an exhaustion of the sources of foreign currency and a rampant corruption. The international support, won with petrodollars, becomes scarcer each time and the purchasing power of its national currency is in a constant downfall ». They admit having created this situation out of whole cloth, with shocking impunity, and consider that it will not change. They justify their actions by claiming that the Venezuelan government will take new « populist » measures in order to stay in power. 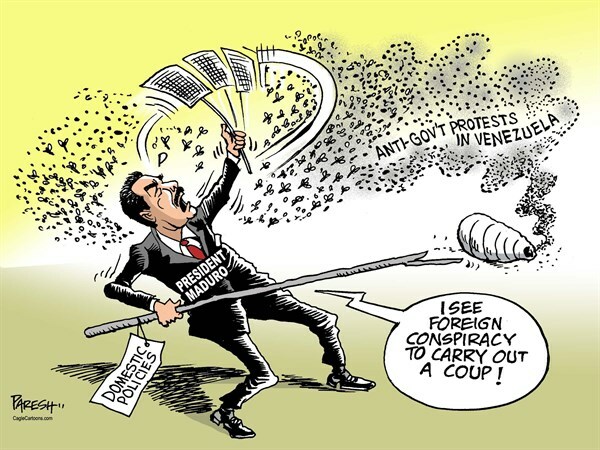 We may be amazed at the treatment reserved for the opposition, which is manipulated, advised and paid for by the United States, because in the report we read that « Maduro’s corrupt regimen will collapse but regrettably, the divided opposing forces, legitimate defenders of democracy and the well-being of their people, do note have power enough to put an end to the Venezuelan nightmare », because of their internal quarrels, and a « corruption similar to that of their rivals; as well as the scarcity of rooting, do not grant them the opportunity to make the most of this situation and to give the necessary step to overturn the state of penury and precariousness in which the pressure group, that exercices the leftist dictatorship has submerged the country ». They consider that we are facing « unprecedented criminal action in Latin America », although the government of Venezuela has never acted against its neighbours, but rather demonstrates intense solidarity, at both the regional and international level. The US plan claims that « democracy spreads out in America, continent in which radical populism was intended to take over ». Argentina, Ecuador and Brazil are given as examples of this. « This rebirth of democracy has the support of the most valuable determinations, and the conditions in the region run in its favour. It is the time for the Unites States to prove, with concrete actions, that they are implicated in that process, where overthrowing Venezuelan Dictatorship will surely mean a continental turning point ». They are also pushing US President Donald Trump to act, on the grounds that « It is the first opportunity of the Trump Administration to bring forward its vision in reference to security and democracy. Showing its active commiment is crucial, not only for the administration, but also for the continent and the world. The time has come to act ». This implies – apart from the definitive eradication of Chavism and the expulsion of his representative – working to « encourage popular dissatisfaction, by increasing scarcity and rise in price » in order to make the rejection of the current dictator irreversible. If we should seek to understand the art of counter-insurgent perversion, it would suffice to read the part of the document which recommends « to besiege [President Maduro], ridicule him and to pose him as symbol of awkwardness and incompetence. To expose him as a puppet of Cuba ». The document also suggests exacerbating the divisions between certain members of the group in power, by underlining the differences in the quality of life of the population compared with that of their leaders, and making sure that these differences are amplified. The idea consists of carrying out lightning operations, in the same way that Mauricio Macri in Argentina and Michel Temer in Brazil had taken certain measures in their own countries. These two valets obey the orders of Washington, and are both corrupt, but now, by imperial grace, they are presented as « examples of transparency » – within a matter of hours, they took measures to ensure the destruction of nation states with the precision of a missile strike. The document, signed by the head of SouthCom, demands that Maduro’s government be made unbearable, in order to force him to hesitate, negotiate or flee. This plan, which is intended to get rid of the alleged dictatorship of Venezuela in short notice, calls for an « increase the internal instability to a critical level, by intensifying the undercapitalization of the country, the leaking out of foreign currency and the deterioration of its monetary base, bringing about the application of new inflationnary measures ». Another objective – « fully obstructing imports, and at the same time discouraging potential foreign investors in order to make more critical the situation for the population ». We may also find in this 11-page plan « appealing to domestic alllies as well as other people inserted from abroad in the national scenario in order to generate protests, riots and insecurity, plunders, thefts, assaults and highjacking of vessels as well as other means of transportation with the intention of deserting this country in crisis through all borderlands and other possible ways, jeopardizing in such a way the National Security of neighbouring frontier nations ». It would also be useful to create « victims » and accuse the leaders for this by magnifying the dimensions of the humanitarian crisis before the eyes of the whole world – for that, it will be necessary to deal in lies, and talk of generalised corruption amongst the leaders and link the government to narco-trafficking in order to dirty its image not only on the internal level, but in the eyes of international opinion – without forgetting to « promote fatigue inside the members of the PSUV [Unified Socialist Party], inciting the annoyance and nonconformity among themselves, for them to break noisily away from the line of the Governement, for them to refuse the measures and restrictions which also affect them […] making it as weak as the opposition is. Creating frictions between the PSUV and “Somos Venezuela” ». That’s not all. It is also necessary to structure « a plan to get the profuse desertion of the most qualified professionnals from the country, in order to “to leave it with no professionnals at all”, which will aggravate even more the internal situation and along these lines putting the blame on of Government ». Just like in a suspense novel, the document calls for « using the army officers as an alternative for a definitive solution » and « continuing hardening the conditions inside the Armes Forces to carry out a coup d’état before concluding 2018, if the crisis does not make the dictatorship to collapse and the dictator does not decide to move aside ». Considering that all of the above may not succeed, and with outright contempt for the Venezuelan opposition, the plan suggests « continuing setting fire to the common frontier with Colombia. Multiplying the traffic of fuel and other goods. The movement of paramilitaries, armed raids and drug trafficking. Provoked armed incidents with the Venezuelan frontier security forces » and besides this, to « recruit paramilitaries mainly in the campsites of refugees in Cúcuta, La Guajira and the north of Santander, areas largely populated by Colombian citizens who emigrated to Venezuela and now return, run away from the regimen to intensify the destabilizing activities in the common frontier between both countries. Making use of the empty space left by the FARC, the belligerency of the ELN and the activities in the area of the Gulf cartel ». And here is the template for the final blow – « to prepare the involvment of allied forces in support the Venezuelan army officiers or to control the internal crisis in the event they delay too much in taking the initiative. Establishing a speedy time line that prevents the Dictator to continue winning control on the international scenario. If it is necessary, act before the elections stipulated for next April ». In fact, these elections will be held on 20 May, and the United States and their associates refuse in advance to recognise the result. The crux of the matter is « to get the support of the cooperation of the allied authorities of friendly countries (Brazil, Argentina, Colombia, Panama and Guyana); to organise the provisionning, relief of troops, medical and logistic support from Panama. Making good use of the facilities of electronic surveillance and signals intelligence, the hospitals and its deployed endowments in Darien [in the Panamanian jungle], the quipped airdromes for the Colombian Plan, as well as the landing fields of the old-time military bases of Howard and Albrook [Pananma], as well as the one belonging to “Rio Hato” in addition, the Humanitarian Regional Center of the United Nations, designed for situations of catastrophes and humanitarian emergency, which has an aerial landing field and its own warehouse ». We are faced with the setting up of an intervention which includes « the basification of combat airplanes and choppers, armored conveyances, intelligence positions and specail military and logistics units (police, and military district attorneys and prisons) ». […] It will be necessary to « develop the military operation under international flag, patronized by the Conference of American Armies, under the protection of the OAS and the supervision, in the legal and media context, of the General Secretary, Luis Almagro ». lt will also be necessary to « declare the necessity that the continental commandement be strengthened to act, using the instrument of the Inter-American Democratic Charter, in order to avoid the democratic rupture », and above all it will be necessary to « bind Brazil, Argentina, Colombia and Panama to the contribution of greater number of troops, to make use of their geographic proximity and experience in operations in forest regions. Strenghtening their international condition with the presence of combat units from the United States of America and the other named countries, under the command of a Joint General Staff led by the USA ». One is astounded by the impunity in which all this is being plotted, behind the backs of the People, in absolute illegality, revealing as it does the reasons for recent US military manoeuvres at the border between Brazil and Venezuela (Brazil, Peru, Colombia), and in the South Atlantic (United States, Chile, United Kingdom, Argentina) – in the case of Argentina, these plans have been progressing since October-November 2017 without the slightest authorisation of the National Congress. – Lean on Brazil and Guyana to make use of the migratory situation that we intend to encourage in the border with Guyana. – Coordinate the support to Colombia, Brazil, Guyana, in Aruba, Curaçao, Trinidad and Tobago, and other States, in front of the flow of Venezuelan immigrants in the event of the crisis ». It is also planned to favour international participation in this effort, as part of the multilateral operation with the contribution of states and non-governmental and international organisations, and furnish whatever is necessary in terms of logistics and intelligence – it will also be necessary to « anticipate, specialy, the most vulnerable points of Aruba, Puerto Carreño, Inirida, Maicao, Barranquilla and Sincelejo in Colombia, as well as Roraima, Manaos and Boavista in Brazil ». So here we have laid out before us the map of an announced war of intervention. As far as the strategic perspective is concerned, it will be necessary to « silence the symbolic presence of Chavez-representative of unit and popular support » while pursuing the harassing of the dictator « as the only responsible, in the first place, for the prevaling crisis due to his inability to find the way out that the Venezuelans are in need of » as well as his closest executives, who will be blamed for the crisis and the impossibility of recovery. In another paragraph, the text calls for the intensification of « the denouncement toward Maduro’s regimem, […] high-lighting the incompetence of the mechanisms of integration created by the regimens of Cuba and Venezuela, specialy the ALBA [Bolivarian Alliance for the Peoples of Our America] and Petrocaribe ». As far as the medias are concerned, the plan drawn up by the United States calls for an increase in the broadcasting, inside the country, by local media and foreign media, of invented messages based on witness reports and publications from the country itself, making use of all means of dissemination, including the social networks, of messages « claming, though the mas media, the need to put an end to this situation because of its unsustainable essence ». In one of the last paragraphs of the document, there is mention of claiming or showing the use of violent means by the dictatorship, in order to gain international support, by using « all the capacities of the psychological war of the US ARMY ». In other words, this means setting up the same scenarios based on lies, news montages, falsified photos and videos, everything that was used during the colonial wars of the 16th century. Another question, « The United States should entirely back up the OAS, strenghtening the image of the OAS and offer multilateral institutions of the inter-American system, as instruments for the solution to regional problems. Promoting the respect of the dispatch of the UNO military force for the imposition of peace, only Nicolas Maduro’s corrupt dictatorship is defeated ». “Plan to overthrow the Venezuelan Dictatorship – “Masterstroke””, by Kurt W. Tidd, Voltaire Network, 23 February 2018. The CIA is thumbing through its well worn ‘Regime Change’ playbook that has been utilised for decades . This aspect is achieved by bribery or coercion and was utilised successfully in Guatamala 1953. America is like a war junkie, sweating and shaking in need of a war fix. This has been a long term plan, by the US scum + of course they cannot have a socialist country doing OK can they? “On May 28, 2014, the United States House of Representatives passed the Venezuelan Human Rights and Democracy Protection Act (H.R. 4587; 113th Congress), a bill that would apply economic sanctions against Venezuelan officials who were involved in the mistreatment of protesters during the 2014 Venezuelan protests”. NOW CHINA AND RUSSIA – MOVE IN. China has invested a lot of money in Venezuela and along with the support of Russia, is an aspect that the US seems to have ignored. The US as a whole is in a real frenzy at the moment. Is that due to the Mid Term Elections, Israels strategic defeat in Syria or a waste heap of debt that threatens to collapse and suffocate the US ? There seems to be an urgency for the US to begin the hot phase of WW3. There is an overall plan of US world energy hegemon, one way or the other; regime changes, wars, occupations, controle of transport corridors. That is true Tommy, however the US Military plans have not gone terribly well when a determined foe of America is willing and able to fight back. Crossing swords with Russia and China would certainly result in devastation on Mainland USA and we must remember that Iran fought a decade of war with the US backed Iraq and the result was a No Score Draw. Iraqi forces used poison gas first and Iran responded later with gas they developed in response. Iraq imported about 1000 tonnes of the precursors for chemical weapons from the US and Europe and these countries also constructed the facilities to make the gases. Mainly Mustard and Nerve agents such as the British VX that was stockpiled by NATO at the time. Not quite a Nil all draw Florian. When Bush 1 launched D/S where did Sadam send his A/F? To Iran. That wasn’t a spur of the moment decision. He obviously knew the Yanki Yelps were coming and made plans in advance. Iran had become a closet ally…..
Saddam also sent assets to Syria if I remember. Supposedly. There was a lot of guff in msm about Sadam moving his WMD to Syria. As usual it was just paper accepting ink, it all fizzled out in the end. China invested a lot of money in Sudan, the US destroyed Sudan. China invested a lot of money in Libya, the US destroyed Libya. And of course the government the US installs, always repudiates the debt to China. That is true ,I agree, however barbarians are eventually cast out if they do not stop their endless violence. South Sudan has suffered circa 400,000 deaths due to the US actions there and as China ascends, the US will fade. The same playbook as used by the US in Syria it seems. It appears the chapter with the legal Russian intervention in the conflict has been censored by the US Fantasy Police. Yep! and who makes all the money and gets the power and influence once a war is over?? – the “behind the managed news curtain” Bankster Cabal that owns and controls the US and many other countries (UK, EU, Australian and Canada) and controls most (98%) of the world’s privately owned Central Banks, including the US FED. The US is simply a compliant and controlled vassal State burning up its blood and treasure for the Bankster parasites. Venezuela is doing the world a great favor by showing what socialism in its extreme form leads to… Any military intervention will just give Maduro fans the opportunity to say that all was great until the Donald started the war. And capitalism works so great. How is it working for you now. Go back to kissing your rich masters bottom. And quit stealing from the poor. You know, a lot has been said about the low IQ of sub-Saharan Africans, the Turnips (oops, I mean Swedes) have proven that in one generation you can lower the national IQ from 110 to 70 in just one generation. You on the Nobel Committee by any chance? Hmmm… I can only imagine whoever was typing that to be a 17-year old who just lost a series of computer games and needed to just to vent his frustration to some random stranger… ‘so’… Am I right? The US is destroying Venezuela, just like it destroyed Iraq Libya Yugoslavia Syria and others. The US always destroys the economies of its enemies first. Communist China has the strongest economy and largest middle class in the world. Why is Russia, China pussyfooting in giving the Empire the first slap in the face??? The longer US is allowed to war, the more wars they will start, growing slowly but surely stronger and more prepared. Starting wars involve spending lots of money. My guess is that they know the US is on the verge of financial collapse. Also, every time the US starts up a war, it digs itself deeper in the hole. No one on the planet will support the US. And when it all goes hot, everyone on the planet will be fighting against the US by any means. In other words, the burden of war will not be carried out alone by China and Russia. Russia should invite Venezuela, Cuba, and Nicaragua to join the CSTO in response to NATO seizing the former Soviet Baltic republics (Estonia, Latvia, and Lithuania). China’s hospital ship is called “Peace Ark” not Arch of Peace. well i stand with this poor BROWN country!!!! !